We were very happy to be able to donate one of our stunning Vanguard Hot Tubs to the ‘Love Your Garden’ show to give the McGinn’s their dream garden. Everyone at HotSpring World was very touched when we heard the story of the McGinns. Pete McGinn is a serving police officer in the West Midlands Police Force, who suffered horrific injuries while attempting to arrest a suspect in June 2013. Pete was lucky to survive his attack, but his injuries included a fractured hip, a fractured pelvis, two breaks to his thigh bone, a smashed knee, two breaks to his lower leg and a fractured shoulder. He had severe trauma, loss of blood and then suffered two huge blood clots on his lungs four weeks after the accident, which nearly killed him. Pete and his wife Suzy have three children, and their eldest daughter Amelia, is severely autistic. Amelia is unable to talk, has no concept of danger and possesses the mental age of a two year old, as a result of cluster seizures when she was two years old. After one seizure, she went into hospital a normal little girl and came out severely autistic, due to brain damage caused by her medication. Amelia lives at home three days a week, requiring 24 hr care. Since the accident, most of the care for Amelia has fallen on Suzy’s shoulders and yet both Pete and Suzy are incredibly upbeat. Love Your Garden wanted to create a true luxury spa feel, and there was no way they felt they would have achieved this without our amazing Vanguard hot tub supplied by HotSpring World. Pete McGinn suffered from horrific injuries in the line of duty and his tough rehabilitation schedule is still ongoing, so we looked into what could benefit Pete in the garden and aid his recovery. 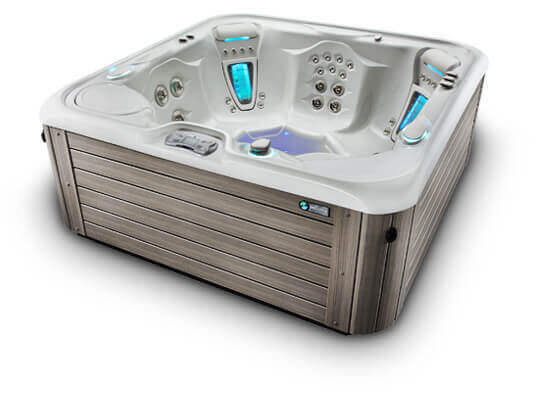 This particular hot tub has been fitted with a salt water system to give a more natural bathing experience and is cheaper to run. We sunk the tub into the gorgeous decking to give a more secluded feel whilst bathing and to integrate the tub into the garden better. Here are some photos taken by our very own Andrew Biggs on the day of the delivery and installation. Some videos taken on the day as the Vanguard hot tub was delivered and installed with the expert help of HTA (Hot Tub Assist).